Bansie Vasvani is a curator and art critic with a focus on Asian and other non-Western art practices. She investigates contemporary art that mines issues of cultural identity, politics, immigration, and the commingling of varied cultural influences. Bansie travels frequently to Asia to study, research, and write critically. Currently she is working on showcasing art from Sri Lanka, Bangladesh, Pakistan and India at several institutions. Her work has appeared in Hyperallergic, ArtAsiaPacific, Art Review Asia, Artnet news, Art21 Magazine, Brooklyn Rail, Sculpture Magazine, Daily Serving, Aesthetica Magazine, and Modern Art Asia amongst many other publications. Bansie has a BA in English literature, Bombay University; an MA in English and American Literature, Northeastern University; ABD (all but dissertation) in English and American Literature, CUNY Graduate Center; and an MA in Modern and Contemporary Art History, Christies Education, New York where she earned the Best Student Award. The long overdue exhibition Lucid Dreams and Distant Visions: South Asian art in the Diaspora, that gives voice to nineteen artists residing in the United States but originally from India, Pakistan, Bangladesh, Tibet, Nepal, and Afghanistan, opened at the Asia Society, and stays in view till 6 August 2017. Featuring numerous works from a variety of mediums, the exhibition is a sophisticated survey of multiple visual languages devised to determine what it means to be people of a diaspora. Coming almost twelve years after the first comprehensive exhibition of its kind at the Queens Museum in 2005 titled “Fatal Love: South Asian American Art Now,” “Lucid Dreams” unequivocally paves the way for what Vishakha Desai, the former president of the Asia Society, and chair of the advisory board of the Smithsonian Asian Pacific American Center, describes as a need to “project” these untold marginalized stories. At the very outset it is evident that haunting memories of family, place, history, and culture metamorphose into a lexicon of imagery that brings potency to the artists’ identities. In perhaps the most dynamic grouping of works in the exhibition, three video installations by artists from Bangladesh, Nepal and Afghanistan address issues of wars, borders, and belonging that merge hope and despair. 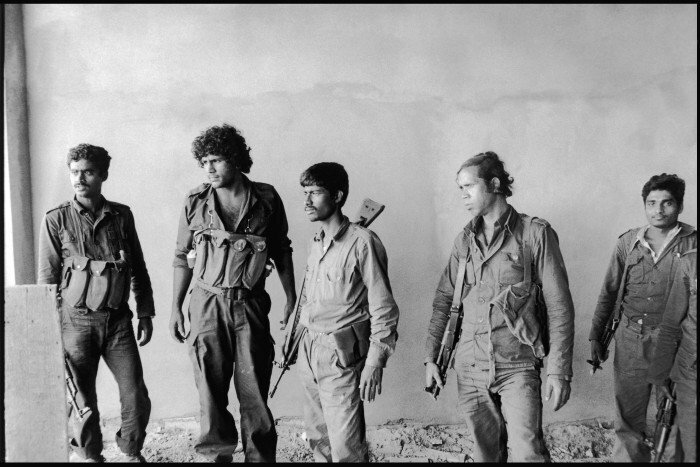 In Naeem Mohaiemen’s single channel video Abu Ammar is Coming (2016), the artist parses found photographs of Bangladeshi freedom fighters in Beirut circa 1980 conscripted to aid the PLO in the Lebanese war. Through his deeply nostalgic voice over, Mohaiemen reflects not only on the men’s unknown identities, but also on the complete disappearance of any extant history of alliance between the two countries. Like Tenzin Tsetan Choklay’s video Bringing Tibet Home (2013), based on Tenzing Rigdol’s covert transportation in 2011 of 20,000 kilograms of Tibetan soil through his native Nepal to Dharamsala in India where the Dalai Lama and a large exiled Tibetan population live, the works bring agency to these untold and achingly personal stories from the diaspora. No longer hindered by responses of indifference to their narratives, these artists essentialize the significance of their origins, histories, and people such that their inherited Eastern identities gain valence. 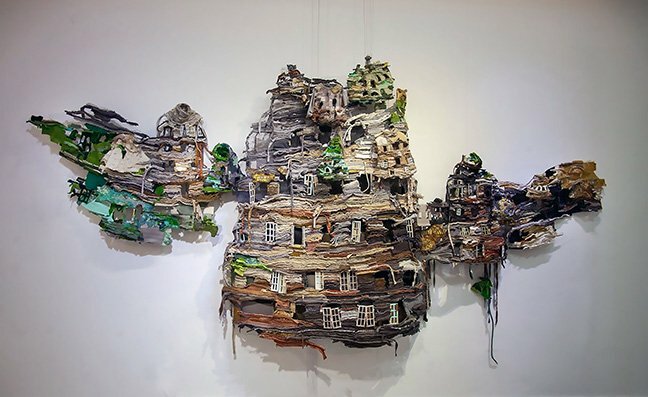 In works like Ruby Chisti’s sculpture, The Present is a Ruin Without the People (2016), constructed from recycled textile that is folded, stacked, and stitched, architecture symbolizes the plight of many immigrants. Chisti’s floating city filled with abandoned homes suggests the increasingly fraught narratives of displacement. Although Chisti’s work does not locate a specific place, it references her own home in Pakistan and other repressive regimes that compel people to flee. The attachment between a place and its people, and the conflicted longing to call a place home that one is often forced to leave is captured through Chisti’s dreamy yet dilapidated airborne metropolis that blends memory and fantasy. In the exhibition, early paintings by Shazia Sikander whose work began to gain traction from the 1990’s are timeless for the way they evoke the politicization of identity that intensified post 9/11. 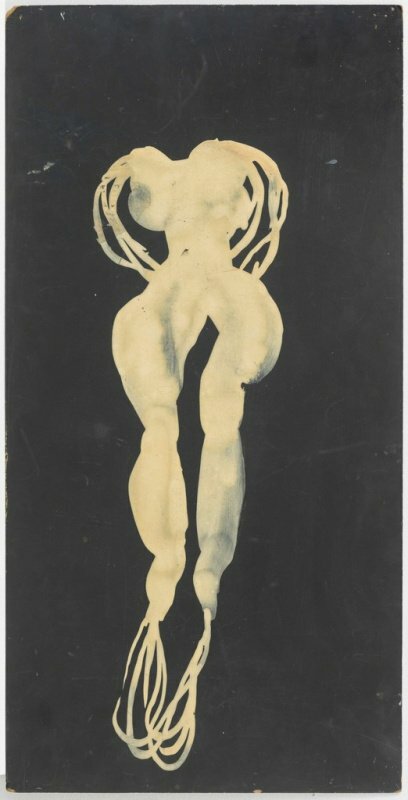 In her incomplete painting, A Slight and Pleasing Dislocation, II (1994 – 1995), the multiple armed headless female form, which conflates Sikander’s native Islamic iconography with the Hindu goddess Kali’s fearlessness in the way the figure bears a sword amongst other destructive objects, is a case in point. 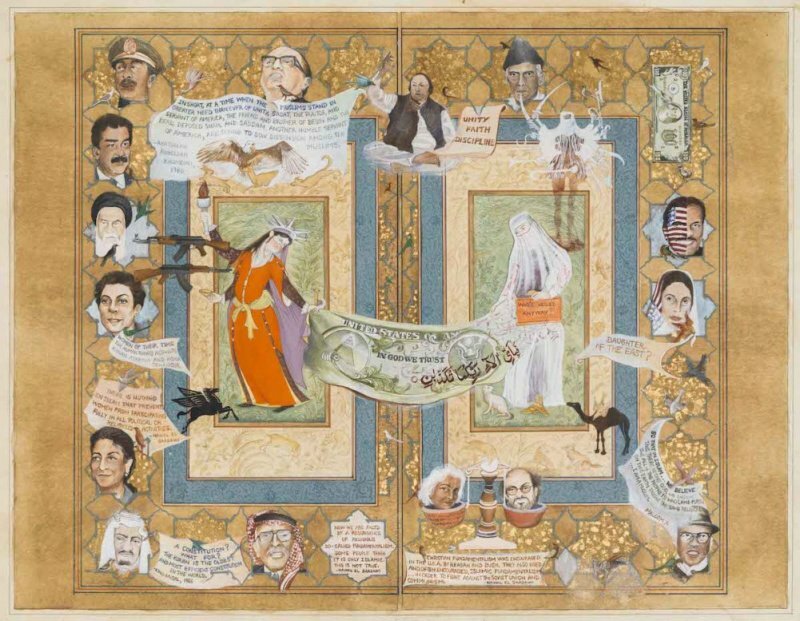 Sikander’s large painting that was a part of a massive installation commissioned in 1994 by a corporate firm in downtown New York was cancelled for its violent imagery. In a conversation at the press preview prior to the opening, Sikander noted that her interest was not in representing identity as much as it was with experimenting with new fluid forms and her own experiences as a female artist. Such works become particularly relevant to the dialogue about misconceptions and the ascription of meaning to art by minorities perceived to be harmful. This highly charged association with Islamic culture gets turned on its head in Allan deSouza’s digital prints from his film Rumpty-Tumpty, # 5-7 (1997/2017). 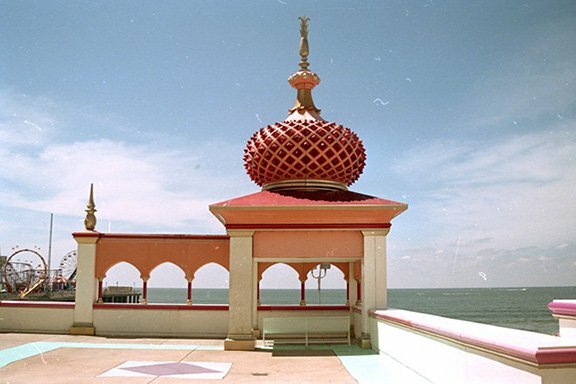 Images of the gaudy Trump Taj Mahal casino in Atlantic City showcases the appropriation of a South Asian Islamic mausoleum to connote exoticness, when in fact the burka clad Muslims in the foreground of the print are exactly the kind of people who are routinely targeted. The difficulties of this double-sided duplicitous view of Islamic antiquities and people of Islamic faith are confronted through these seemingly innocuous pictures. In other works, like Chitra Ganesh’s marvelous graphite and charcoal drawings on paper, female empowerment takes center stage. Stills of a Bollywood actress playing the role of a mythological figure get transformed into monuments of Indian femininity and power. And in Jaishri Abichandani’s wall hanging We Were Making History, 3 (2013), created with leather whips, the shapes of abstracted protesters inspired by images of Arab Spring in Tahir Square, Cairo, seem like a rallying cry for women and her own South Asian community to be made more visible. But the very nature of acculturation for minority immigrants vis-a-vis the host society results in the intersection of identities and gaps in understanding what that means. It is this engagement between the artists’ inherited identity and the orientation towards adopting the host culture that often leads to distortion and inversion. Kanishka Raja’s I and I (MISSED TWICE): SWI-XY (2014), series, is emblematic of this process. 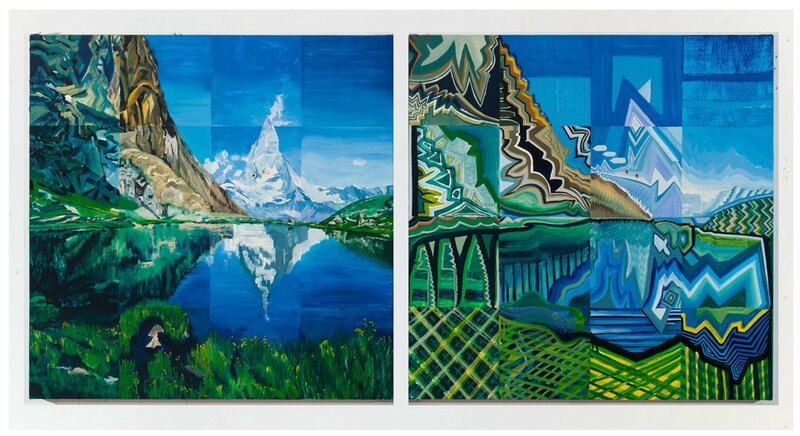 Generic paintings of lush Swiss landscapes become charged with transposing issues of power and perception. Here the perfect Swiss scape represents Bollywood’s consecration of Swiss scenery as an alternative to Kashmir’s unaccessible disputed territory. Raja’s painstaking process of making multiple inversions, abstractions, and reproductions of the picture postcard image on different surfaces by way of embroidery and screen printing not only decenters, dilutes, and reverses the east west power dynamic, but the series also highlight the significance of South Asian craft which is utilized to reproduce the embroidered panels in Kolkata where Raja’s family lives. The artists in this exhibition, much like the multifaceted protagonist from an Indian call center in Annu Palakunnathu Matthew’s lenticular print, Anirudh, from The Virtual Immigrant series (2006), have forged their own voices to reveal, illuminate, and bring meaning to the gaps in cultural and political understanding of their cultures. Their hybrid taxonomies compel viewers to grapple with complex narratives from the diaspora. Ultimately, by refusing to subsume their ethnicities, the participants and works in “Lucid Dreams,” most certainly uphold what its title suggests. Bansie Vasvani is a curator and art critic with a focus on Asian and other non-Western art practices. She investigates contemporary art that mines issues of cultural identity, politics, immigration, and the commingling of varied cultural influences. Bansie travels frequently to Asia to study, research, and write critically. Currently she is working on showcasing art from Sri Lanka, Bangladesh, Pakistan and India at several institutions. Her work has appeared in Hyperallergic, ArtAsiaPacific, Art Review Asia, Artnet news, Art21 Magazine, Brooklyn Rail, Sculpture Magazine, Daily Serving, Aesthetica Magazine, and Modern Art Asia amongst many other publications. Bansie has a BA in English literature, Bombay University; an MA in English and American Literature, Northeastern University; ABD (all but dissertation) in English and American Literature, CUNY Graduate Center; and an MA in Modern and Contemporary Art History, Christies Education, New York where she earned the Best Student Award.